Firing Advanced Ceramics in High-Temperature Furnaces - L&L Special Furnace Co, Inc.
On April 12, 1981, when the first space shuttle lifted from its launching pad in Cape Canaveral, Fla., the employees of Johns-Manville Corp. breathed a sigh of relief. This sigh would only be completed upon the successful return of the space shuttle Columbia after a safe landing on Earth 54.5 hours later. The entire bottom of the space shuttle was covered with armor-like tile that is formed from pure silica fibers. This tile was formed and heated to 2,200°F in a furnace, which allowed for a ceramic bond to form. The tile was made from Q-Fiber™, which was placed into production in a white-glove facility in Waterville, Ohio. The fibers were never touched by human hands; computers continually gauged the quality, and X-ray units measured the material’s density from every conceivable angle. The high-temperature firing of ceramics is a very dynamic field. The space shuttle tile is merely one high-profile example of how high-temperature ceramics are used. Most, if not all, ceramic components start as a fibrous or slurry-based material. After undergoing various pre-processing steps to refine and shape the material, ceramics are transformed in various ways by being exposed to high temperatures. Some advanced ceramics need to be heated to temperatures up to 3,100°F (1,700°C) and beyond. One field that currently uses a variety of furnaces in its processes is the dental implant field. The implants can be for a single tooth or for complex bridges and permanent porcelain dental parts. A mold is taken from the patient’s mouth and entered into a 3D computer program. In the meantime, a ceramic composite is extruded and cut into various squares and disks, which are placed into a highly uniform furnace and heated to 2,050°F (1,120°C). It is imperative that the temperature uniformity be maintained at ± 5°F (2.5°C) for the duration of the cycle. This ultra-critical uniformity is required to ensure that the part does not shrink or distort as the water is driven out and the porcelain bonding occurs. These fired disks and cubes are then machined by a computer into the finished product. Another field that is constantly evolving is the medical field. Many existing and developing applications use high-temperature furnaces. The surgical implant device field is one area that has had a long-standing need for high-temperature ceramics. Many companies use high-temperature furnaces to sinter pure alumina powder at temperatures up to 2,500°F (1,371°C). The sintered powder is then separated from the hard crust that forms on the surface. The fine alumina powder is slurried and then applied to such medical implant devices as hip joints and knees. Advanced electro-ceramics, such as piezoelectronics, dielectrics, ferrites and others, are interesting for their varying electrical properties. High-temperature furnaces are used to fire ceramics found in many of these electronic fields. One recent application is one in which a series of discs is formed from a ceramic powder mixed into a slurry and pressed in a 20-ton press to various sizes. The discs are fired to 3,100°F (1,700°C) to form a hard and extremely dense fired ceramic component that is used in the communication field for cellular telephone towers around the world. Remotely controlled undersea cameras and other manned devices also use technical ceramics that require high-fire furnaces. In addition to certain electronic components inside these cameras, high-temperature ceramics can find applications in buoyancy devices, in which a sphere or part of a sphere made from alumina of precise thickness is heated to 3,000°F (1,650°C). These spheres are then post-process-heated and placed in buoyancy nets. Some of the spheres are made in two halves and then fit together with a ceramic bonding material. They are then heated again to 3,000°F (1,650°C) to complete the ceramic bonding. The thickness is ultra-critical as it determines the amount of pressure the buoyancy sphere can withstand, which is especially necessary for deep exploratory dives. The ocean bottom is becoming better understood as a result of the confluence of many technical advances, not the least of which is the development of more accurate temperature control devices for these high-temperature furnaces. A lot of teamwork between the user and the equipment manufacturer goes into making these processes function properly. 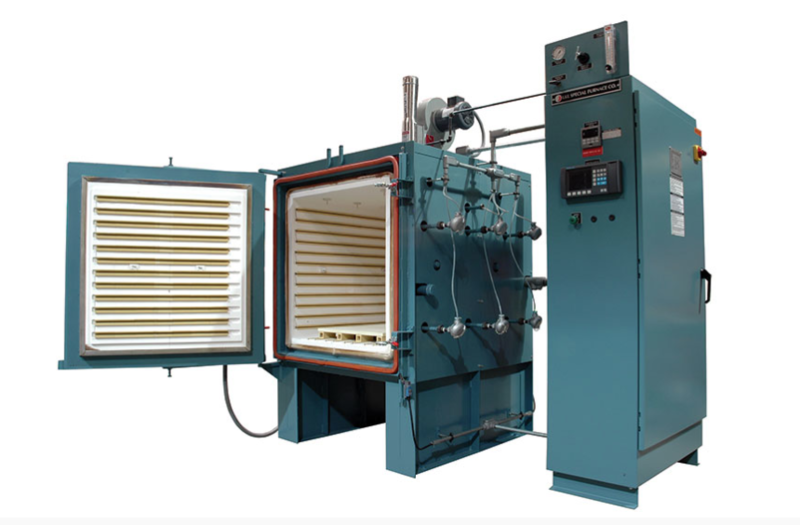 When choosing furnace equipment, a detailed description of the firing cycle, the mass and specific heat of the materials being processed, and the desired throughput must come from the user. Utilities schedules must be developed, including fuel type and capacity, as well as ancillaries such as any process gases and compressed air for loading doors and any other motion-controlled devices. Once the equipment is designed and built, a great deal of testing is sometimes needed at the equipment manufacturer’s facility. Temperature uniformity surveys are undertaken to determine the characteristics of the chamber. In many cases, actual product samples are run through exacting process cycles using inert and active gases to simulate actual process conditions. These processes are supplemented and further refined at the user’s facility, with adjustments made until all of the desired properties are obtained in the final product.